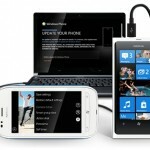 Good news for the all owners of Nokia Lumia 610 Windows Phone. Start today, Nokia rolling out the new firmware version 1600.0000.8779.12340 for Nokia Lumia 610. Actually This update is not the Windows Phone 7.8 update. This update brings severals improvements and usablity. The update will be rolled out to different countries at different times.